This is the first scholarly book devoted to the study of the term dharma within the broad scope of Indian cultural and religious history. Most generalizations about Indian culture and religion upon close scrutiny turn out to be inaccurate. An exception undoubtedly is the term dharma. This term and the notions underlying it clearly constitute the most central feature of Indian civilization down the centuries, irrespective of linguistic, sectarian, or regional differences. 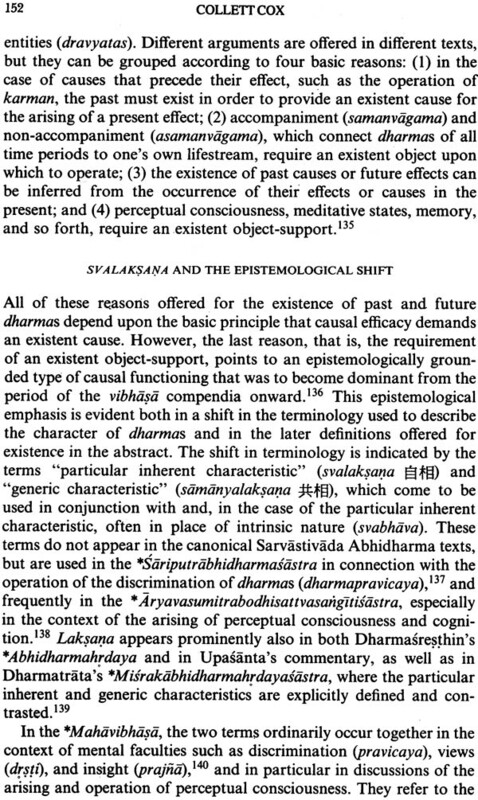 The nineteen papers included in this collection deal with many significant historical manifestations of the term dharma. 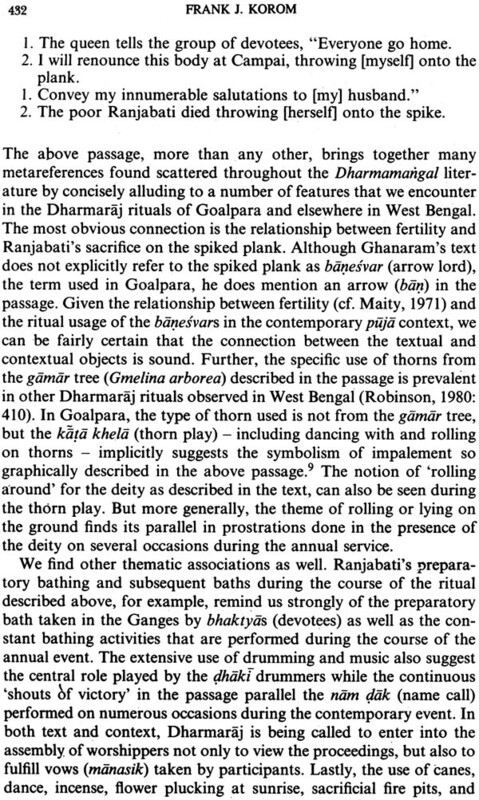 These studies by some of the leading scholars in the respective fields will both present a more nuanced picture of the semantic history of dharma by putting contours onto the flat landscape we have inherited and spur further studies of this concept so central for understanding the cultural history of the Indian subcontinent. 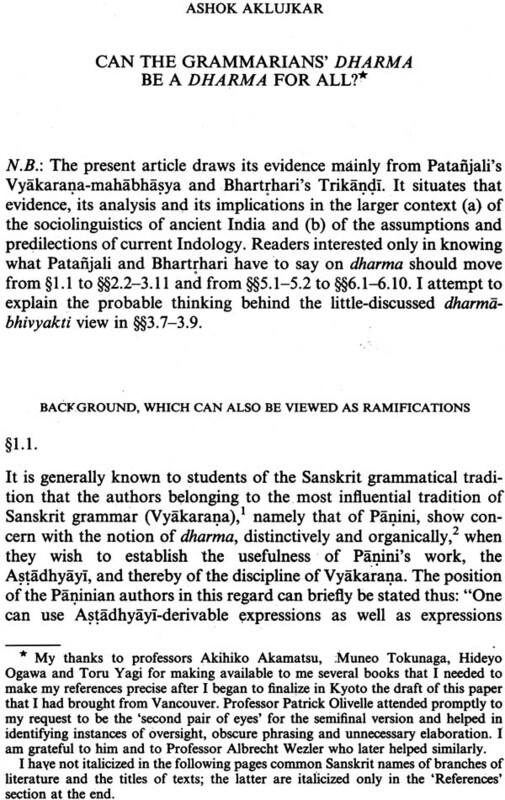 Patrick Olivelle is the Chair, Department of Asian studies, where he is the professor of Sanskrit and Indian Religions. 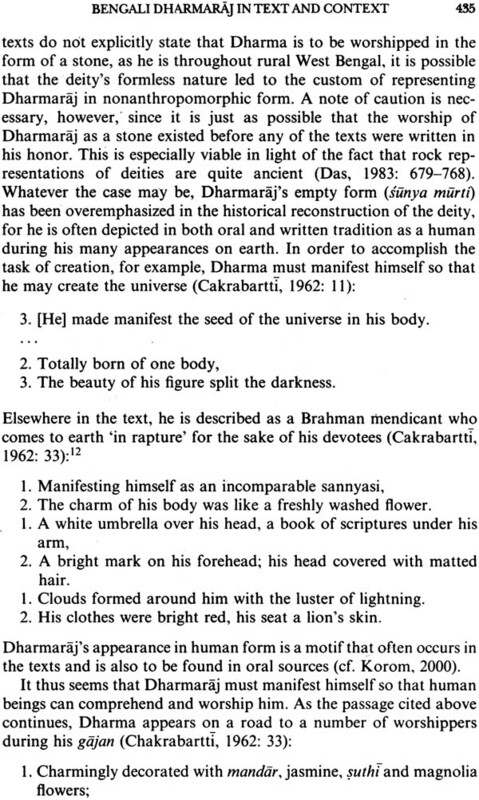 His work has covered the ascetical traditions of Indian, the Upanisads, and the Dharmasastras. 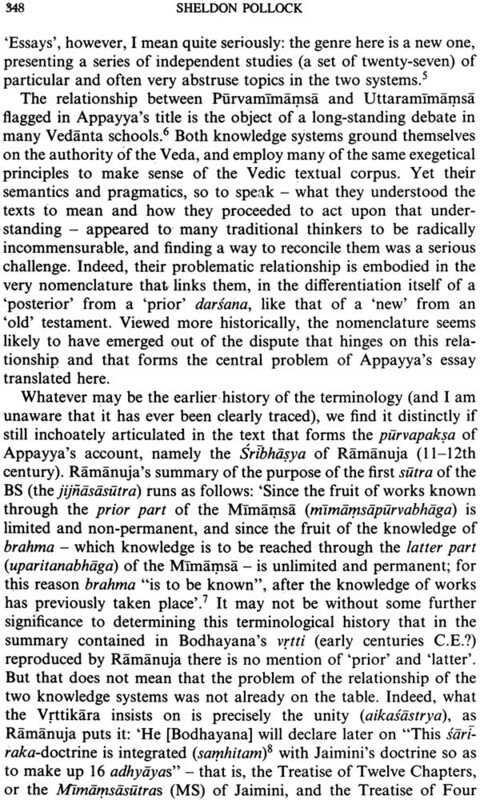 Among his major publications are The Asrama System: History and Hermeneutics of a Religious Institution (Oxford, 1993), Pancatantra (1997), The early Upanisads: Annotated Text Translation (Oxford, 1998), Dharmasutra: The law Codes of Apastamba, Gautama, Baudhayana, and Vasistha (Motila Banarsidass, 2000), Manu's Code of Law: A critical edition and translation of the Manava Dharmasastra (Oxford, 2005), and Dharmasutra Parallels: Containing the Dharmasutras of Apastamba, Gautama, Baudhayana, and Vasistha (Motilal Banarsidass, 2005). Most generalizations about Indian culture and religion upon close scrutiny turn out to be inaccurate. An exception undoubtedly is the term dharma. 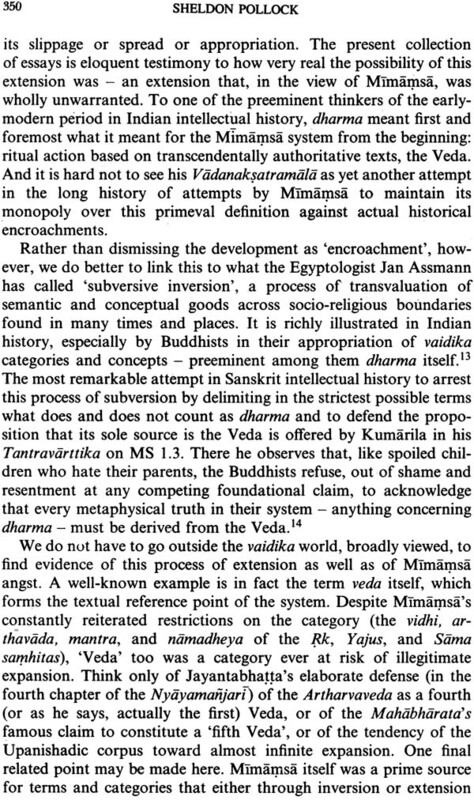 This term and the notions underlying it clearly constitute the most central feature of Indian civilization down the centuries, irrespective of linguistic, sectarian, or regional differences. 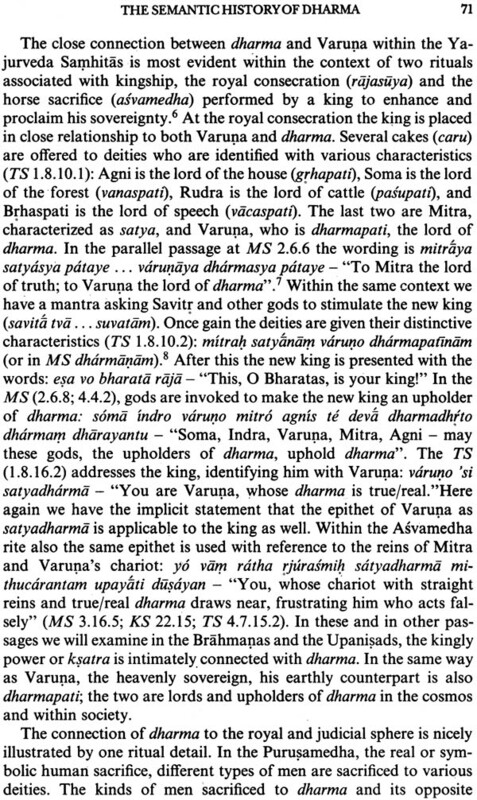 In a special way, the centrality of dharma to the understanding of Indian religions has been recognized by all scholars. 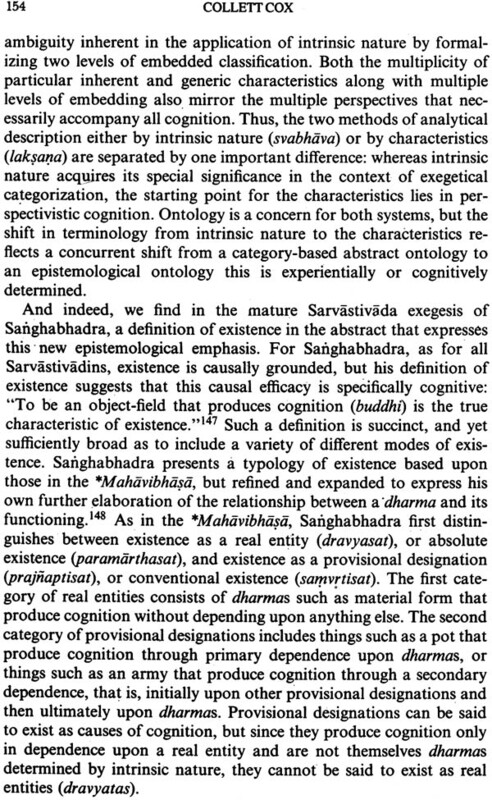 One has only to pick up any introduction to Hinduism of Buddhism to note the prominence given to this term by the authors. 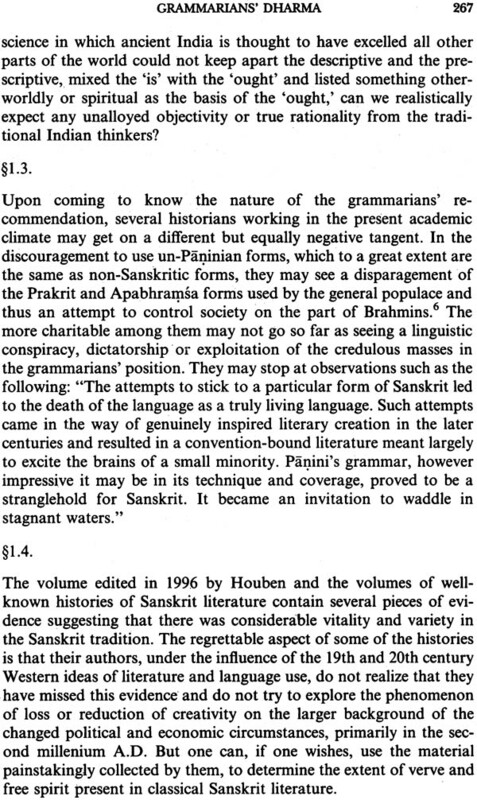 Many note the broad semantic compass of the term, often commenting that the term is "untranslatable". 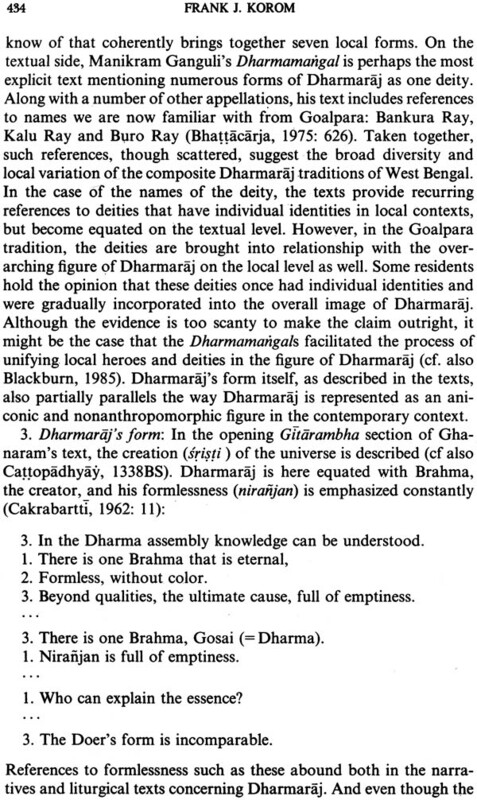 One is also left with the impression that, following the orientalist image of the "unchanging" India, dharma has always been the central concept of Indian religion and culture, that this term has not been subject to evolution and change as its was appropriated, challenged, and sometimes even rejected by different groups and traditions. 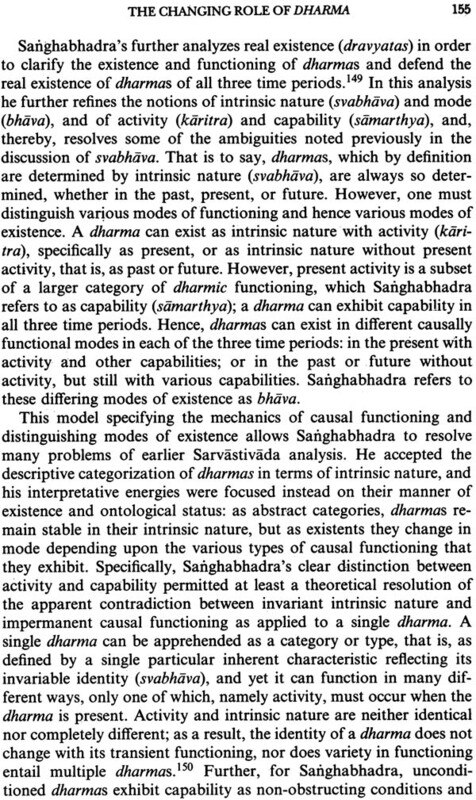 Several years ago as I was working on an edition and translation of the Dharmasastras I began to inquire why a new genre of literature should emerge at a particular point in history devoted to the notion of dharma. The emergence of such new genres generally point of new social, economic, and religions circumstances. 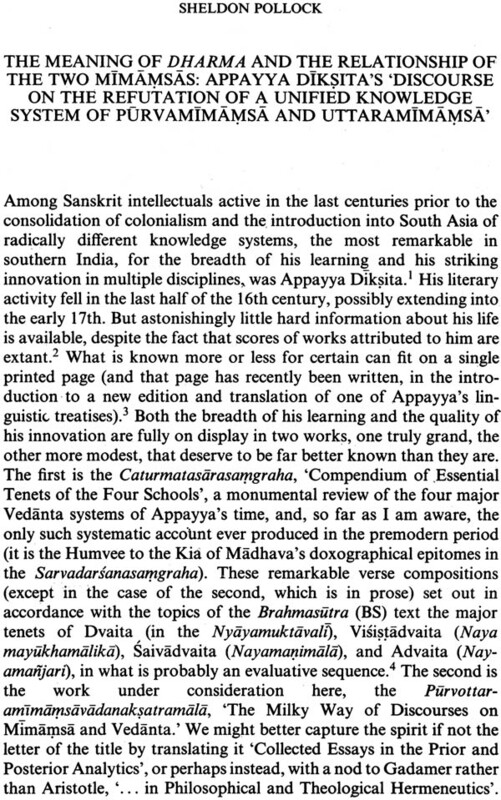 Invited to present a paper at a conference on "Asceticism and power" at the school of oriental and African studies in London in 2001, I began to investigate the use of dharma in the Vedic corpus. 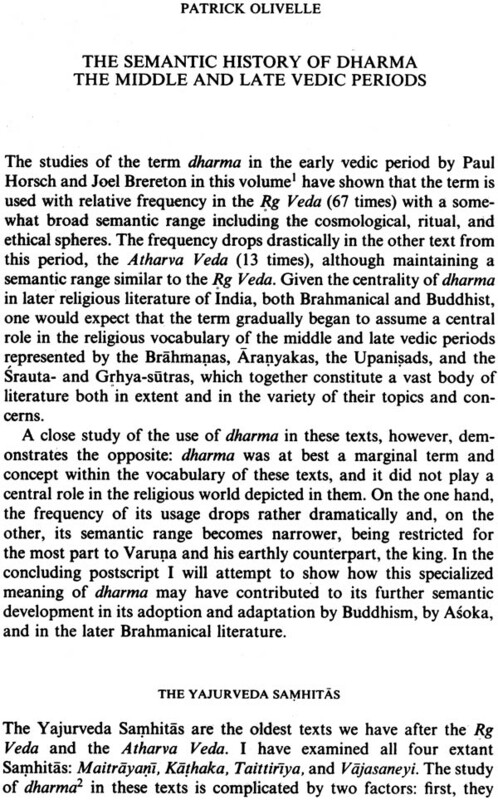 To my surprise I found that the term was used sparingly in the texts of the middle and late Vedic period; it certainly was not the central term in the religious vocabulary of the Vedas. 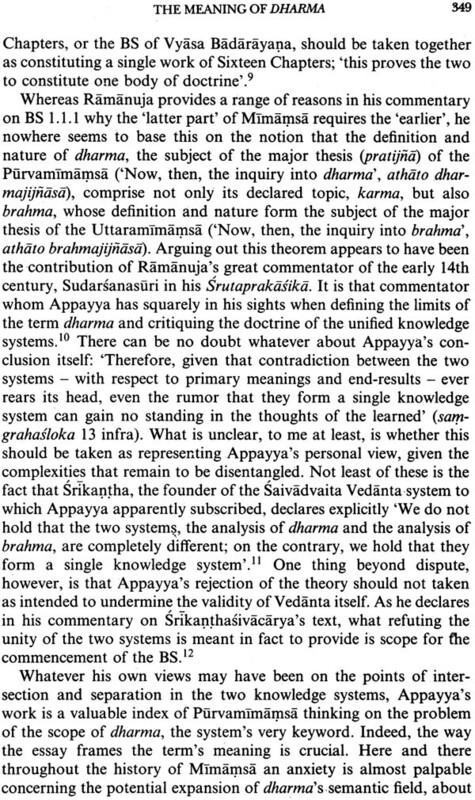 The idea of a volume dedicated to investigating the history of dharma was born from those early investigations. 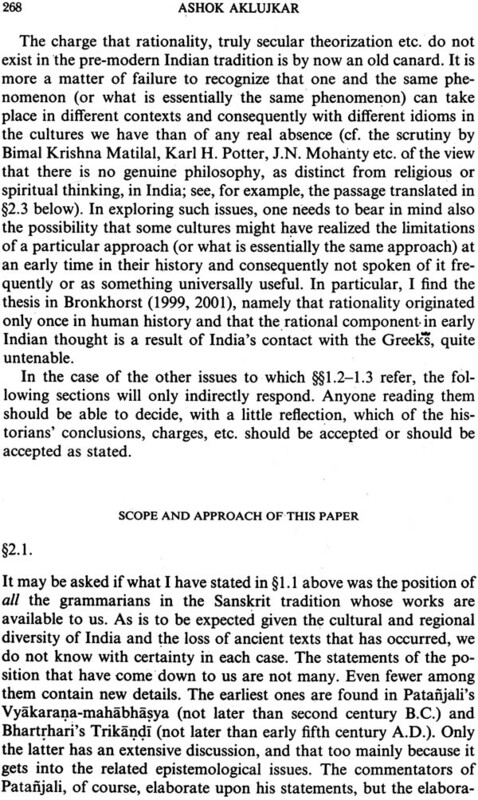 I want to thank Phyllis Ganoff for enthusiastically embracing this idea and for devoting a volume of the Journal of Indian Philosophy for this purpose. 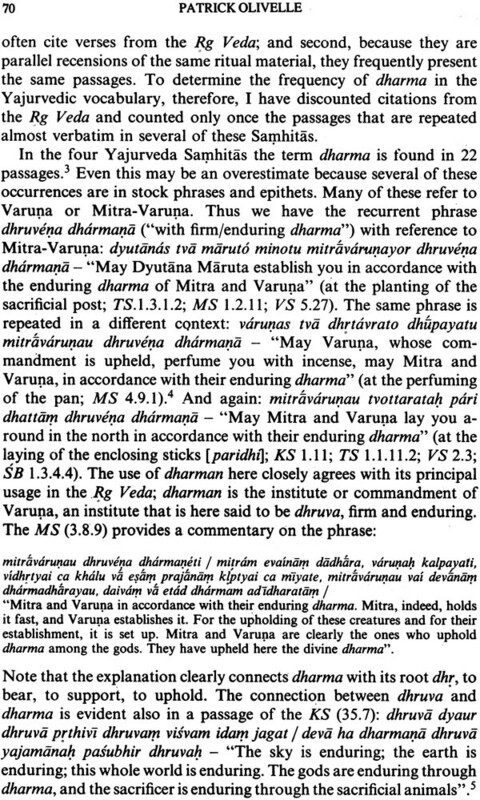 The seventeen papers included in this collection deal with many significant historical manifestations of the term dharma; they do not deal with all. There are many areas that are untouched by these contributions. 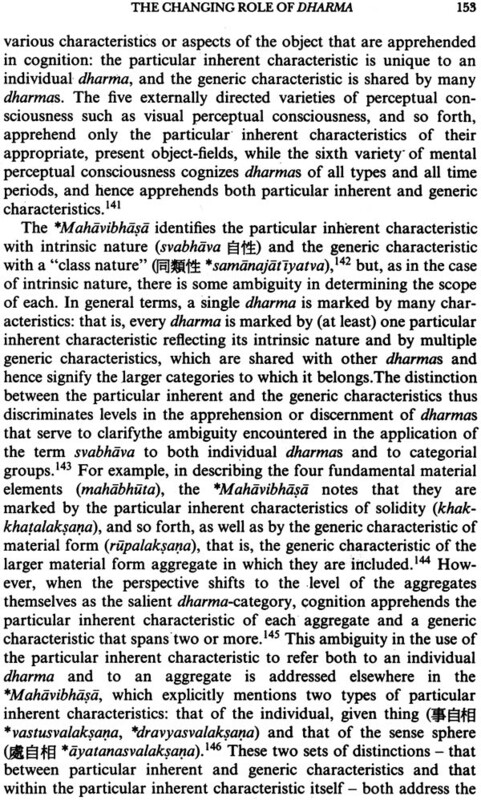 Some have been the subject of other studies, such as the Pali term dharma studied by the Geigers. 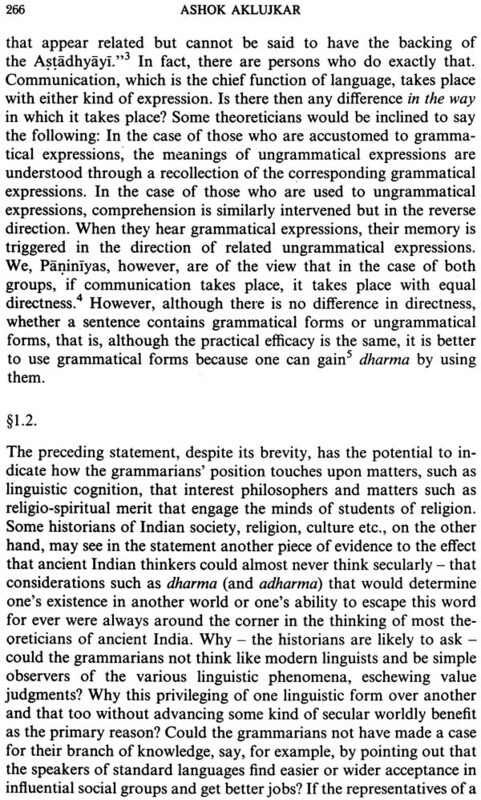 Others, such as the medieval and modern appropriations of the term, especially within the language of religious nationalism (Hindutva) in India and in the vocabularies of contemporary Indian villages, remain to be studied. The selection of the topics covered in this volume was dictated, on the one hand, by the significant areas that demanded coverage and, on the other, by the availability of scholars who were willing and able to contribute. 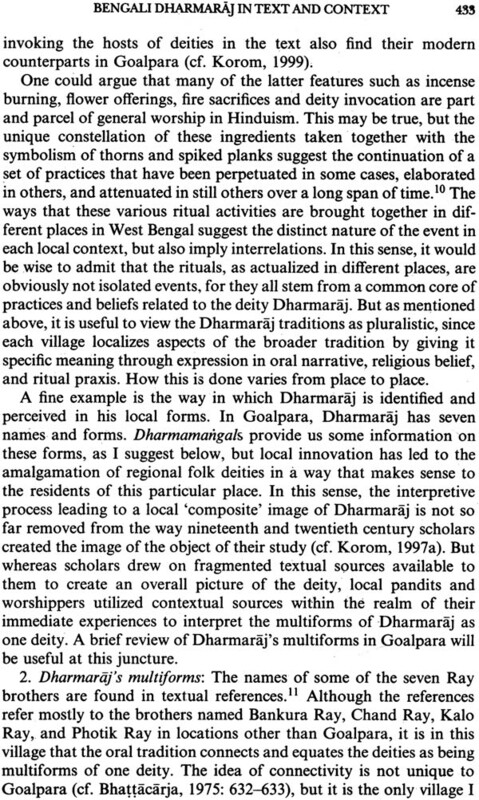 Nevertheless, I hope that these studies by some of the leading scholars in the respective fields will both present a more nuanced picture of the semantic history of dharma by putting contours onto the flat landscape we have inherited and spur further studies of this concept so central for understanding the cultural history of the Indian subcontinent. Finally, I want to thank Mr. N.P. Jain and Motilal Banarsidasss for agreeing to publish this volume as a book so that it may be made available to a wider audience. 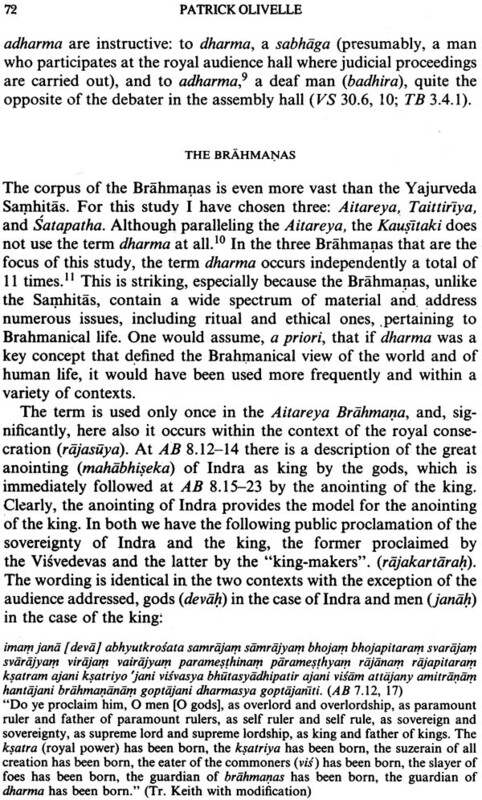 In this book, two additional studies are included, John Taber's important article "The significance of Kumarila's Philosophy" and Paul Hacker's "Dharma in Hinduism" because it deals with dharma within a broader perspective of its development with the Hindu tradition.